The "All For the Girls" challenge at DigitallySweetChallenges inspired me to create TWO new digital collage sheets using vintage photos, available at Lunagirl.com. 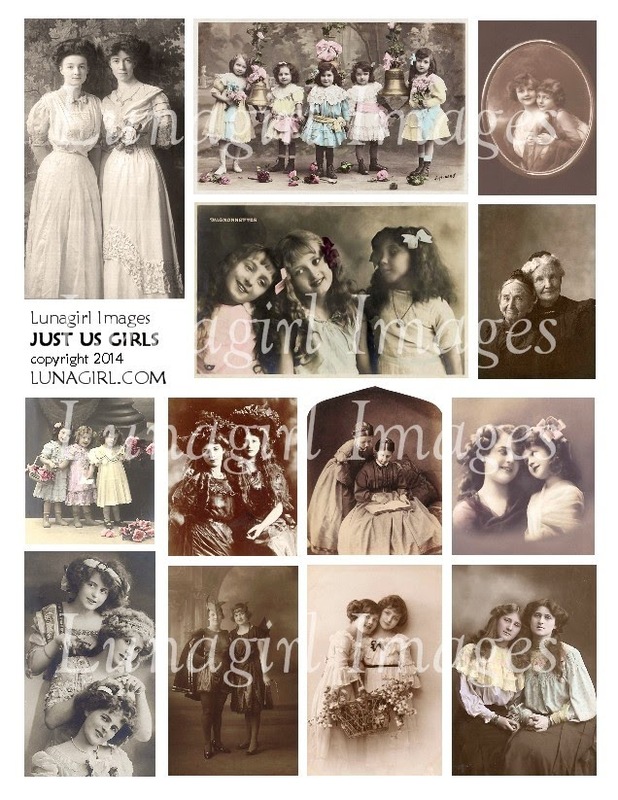 Called "Just Us Girls" (shown here) and Just Us Girls #2, these feature altered postcards and photographs of Victorian Edwardian women and children who are sisters, friends, companions. Little girls in party dresses, friends old and young, even some fabulous ladies in Halloween costumes (my favorite). Sweet and fun, and perfect for the DSC challenge! They would also be perfect vintage printables for birthday cards, greeting cards, altered art projects, scrapbooking layouts, etc.